Background: The fruit decoction of Ziziphus xylopyrus (Retz) Willd. is used toward increase sterility in woman intended birth control in some parts of Rajasthan, India. This plant is widely used in Turkish medicines as a potent sedative. One to two inches of the fresh stem bark of this species are chewed with 1-2 peppers, and the sap swallowed once a day for 5 days in the treatment of cough. Standardization is one of the challenges in herbal medicine. It is essential to evaluate the herbal plants scientifically and proper documentation should be made to know their medicinal properties. Materials and Methods: Leaf samples of Z. xylopyrus were studied as recommended by World Health Organization for morphological, microscopic, physicochemical, phytochemical, powder characteristics and other methods for standardization. Results: Morphologically the leaves are obovate or orbicular in shape, pinnate venation having aromatic odour and pungent taste. Microscopically leaves showed the presence of ground tissue, vascular strand, xylem and phloem. The crystals are mostly rosette type. Microscopic examination of powder showed the presence of stomata, covering trichomes, sclerenchyma, collenchyma, epidermal cells and vascular strands. Phytochemical screening of the plant part with various solvents revealed the presence of alkaloids, carbohydrates, steroids and sterol, glycosides, saponins, flavonoids, phenolic compounds, triterpenoids in it. Physicochemical parameters such as ash value extractive values were also determined and results showed that water soluble extractive value to be higher than alcohol soluble extractive value. Conclusion: Results may be helpful for further confirmation of selected species and in future these characters may be compared with the new batch of the same plant materials. Ziziphus xylopyrus family Rhamnaceae is commonly known as Jujab in English. It is a large, straggling shrub or a small tree, armed with spines, up to 4 m in height. Fruits are globose, 3-rarely 2 or 4-celled, with usually a seed in each cell, very hard and woody. It is found in Pakistan and China, North-Western India, Uttar Pradesh, Bihar, Central and South India. The fruit decoction of this plant is used in birth control in some parts of Rajasthan, India. This plant is widely used in Turkish medicine as a potent sedative. Bark and leaf powder paste are applied externally for chest pain arising from cough. In stomach ache and indigestion, fruit powder (3-4 g) is administered with a pinch of ginger powder thrice in a day. The leaves contain quercetin and quecitrin. The bark contains tannins (7.2%) 7, 3, 4-trihydroxy flavan-3, 4-diol and oleanic acid. Z. xylopyrus is used in Pyorrhoea and to check oogenesis. The bark is used for its astringent activity and as dental sticks for teeth cleaning. In different parts of India this plant is also used in the treatment of diarrhoea. Leaf paste is applied on pimples and it is ground along with latex of Ipomea carnea and applied on boils. One to two inches of the fresh stem bark of this species are chewed with 1-2 peppers (Piper nigrum) and the sap swallowed once a day for 5 days in the treatment of cough. Xylopyrine-A and Xylopyrine-B, the two new 13-membered cyclopeptide alkaloids are also present in Ziziphus species i.e. Z. xylopyra. Available literature reveals that pharmacognostic study on leaf was reported,  but not extensive study hence the present investigation was undertaken. Thus, establishment of the pharmacognostic profile of the leaves of Z. xylopyrus will assist in standardization of the latter that can assure quality, purity and identification of samples. Fresh leaves of the plant were collected in the month of July from Tirupati district, Andhra Pradesh, India. The plant was authenticated by the botanist, Dr. K. Madhavachetty, Assistant Professor, Department of Botany, Sri Venkateshwara University, Tirupati, Andhra Pradesh, India. 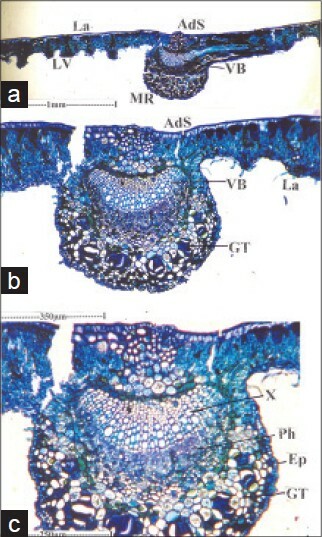 The leaves consist of abaxially protruding thick and midrib abaxially ridged lamina [Figure 1]a. The midrib is planoconvex with flat adaxial side and semicircular abaxial part. The midrib is 550 μm thick and 550 μm wide. The epidermal layer of the midrib is thin, less conspicuous, the cells being small and thick walled. The ground tissue is parenchymatous. The cells are circular and compact. Some of the ground cells are dilated and are filled with mucilage. Other cells contain calcium oxalate druses. These cells are similar to normal cells. The vascular strand is single, it is slightly concave, arc shaped strand. It is collateral with adaxial xylem and abaxial phloem. The xylem elements are in long, narrow parallel compact lines [Figure 1]b and c. Pholem occurs in thick abaxial arc and comprises sieve elements and parenchyma cells. Calcium oxalate crystals are abundant in the midrib and lateral veins [Figure 2]a. The crystals are mostly rosette type. The rosette type of crystals was circular plate with spiny margin and central core dark organic substance. The rosettes in the phloem parenchyma of the midrib is smaller while those in the ground parenchyma are larger [Figure 2]b. The crystals are 15-20 μm in diameter. The lateral veins are prominent on the abaxial side. They project into thick abaxial ridges and possess small, centrally placed collateral vascular strand [Figure 2]c. The ridges are 100 μm thick. Powder microscopic examination showed the presence of stomata, covering trichomes, sclerenchyma, collenchyma, epidermal cells and vascular strand in Z. xylopyrus [Figure 3]a-f. The results of phytochemical screening of the various extracts of Z. xylopyrus leaves revealed the presence of alkaloids, carbohydrates, steriods and sterol, glycoside, saponins, flavonoids, phenolic compounds and triterpenoids shown in [Table 1]. 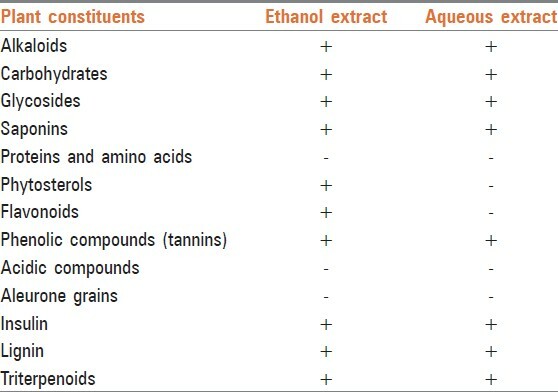 These secondary metabolites are known to possess various pharmacological effects and may be responsible for various actions of Z. xylopyrus. The calculated physicochemical parameters such as ash values, extractive values of the leaves of Z. xylopyrus are presented in [Table 2]. Ethnobotonically, the leaves of this plant were used by local people of Tirupati district, Andhra Pradesh, India in the treatment of various disease conditions without proper standardization techniques. The standardization of crude drug is an integral part of establishing its correct identity. Before any crude drug can be included in herbal pharmacopoeia, pharmacognostic parameters and standards must be established. Microscopic method is one of the simplest and cheapest methods to start with for establishing the correct identity of the source materials. ,,,, The pharmacognostic standards and phytochemical screening for leaves of Z. xylopyrus have been carried out in an extensive way in this study. The macroscopic characters of leaves can serve as diagnostic parameters. Microscopically leaves showed the presence of parenchymatous ground tissue, single vascular strand, the xylem elements are in long, narrow parallel compact lines. Pholem occurs in thick abaxial arc and comprises sieve elements and parenchyma cells. The crystals are mostly rosette type. Preliminary phytochemical screening was carried out and result showed that the presence of alkaloids, carbohydrates, steriods and sterol, glycosides, saponins, flavonoids, phenolic compounds, triterpenoids, Insulin and lignin in ethanolic and aqueous extracts of leaves. This phytochemical screening suggests that the leaves, ethanolic and aqueous extracts of Z. xylopyrus probably contain active lead molecule and this provides the basis for their use as a cure for some human ailments in folklore. These parameter which reported for first time, could be useful in setting the diagnostic characters for the identification and preparation of a monograph of the Z. xylopyrus plant. Authors wish to thank JSS University Mysore, (India) for providing facilities to conduct this research work. Authors also acknowledge the help of Dr. K. Madhavachetty, Assistant Professor, Department of Botany, Sri Venkateshwara University, Tirupati, Andhra Pradesh (India) in the collection and authentication of the plant material. 1. Department of AYUSH. Ayurvedic Pharmacopoeia of India. Part-1, Vol. 5. Delhi: Govt. of India, Department of ISM and H, Published by the Controller of Publications; 2006. p. 47. 2. Anonymous. The Wealth of India: Raw Materials Series. Vol. 11 (X-Z). New Delhi: NISCAIR, CSIR; 1976. p. 123-4. 3. Jain A, Katewa SS, Chaudhary BL, Galav P. Folk herbal medicines used in birth control and sexual diseases by tribals of southern Rajasthan, India. J Ethnopharmacol 2004;90:171-7. 4. Jagtap SD, Deokule SS, Bhosle SV. Some unique ethnomedicinal uses of plants used by the Korku tribe of Amravati district of Maharashtra, India. J Ethnopharmacol 2006;107:463-9. 5. Yadav M, Meena AK, Rao MM, Kapil P, Panda P, Chahal J, et al. Review on Ziziphus xylopyrus: A potential traditional drug. J Pharm Res 2011;4:922-3. 6. Meena AK, Rao MM. Folk herbal medicines used by the Meena community in Rajasthan. Asian J Tradit Med 2010;5:19-31. 7. Dash SK, Padhy S. Review on ethnomedicines for diarrhoea diseases from Orissa prevalence versus culture. J Hum Ecol 2006;20:59-64. 8. Naidu KA, Khasim SM. Contribution to the floristic diversity and ethno botany of Eastern Ghats in Andhra Pradesh, India. Ethnobotanical Leaflets 2010;14:920-41. 9. Reddy KN, Reddy CS, Trimurthulu G. Ethno botanical survey on respiratory disorders in Eastern Ghats of Andhra Pradesh, India. Ethnobotanical Leaflets 2006;10:139-48. 10. Singh AK, Pandey MB, Singh VP, Pandey VB. Xylopyrine-A and xylopyrine-B, two new peptide alkaloids from Zizyphus xylopyra. Nat Prod Res 2007;21:1114-20. 11. Jain S, Sharma C, Khatri P, Jain A, Vaidya A. Pharmacognostic and Phytochemical Investigations of the leaves of Ziziphus xylopyrus (Retz) Wild. Int J Pharm Pharm Sci 2011;3:122-5. 12. Evans WC, Trease D. Pharmacognosy. Edinburgh Saunders Company; 2002. p. 519-20. 13. Wallis TE. Text book of Pharmacognosy. New Delhi CBS Publishers and Distributors; 1985. p. 572-5. 14. Sass JE. Elements of Botanical Micro Technique. 1 st ed. New York: McGraw Hill Book and Co.; 1940. p. 222. 15. O'Brien TP, Feder N, McCull ME. Polychromatic staining of plant cell wallsby toludine blue-O. Protoplasma 1964;59:364-73. 16. Easu K. Plant Anatomy. 3 rd ed. New York: John Wiley and Sons; 1964. p. 767. 17. Kokate CK. Practical Pharmacognosy. 1 st ed. New Delhi: Vallabh Prakashan; 1986. p. 17-24. 18. Kokate CK, Purohit AP, Gokhale SB. The Text Book of Pharmacognosy. 3 rd ed. New Delhi: Vallabh Prakashan; 1991. p. 606-11. 19. Khandelwal KR. Practical Pharmacognosy. Pune: Nirali Prakashan; 2007. p. 149-56. 20. Anonymous. Indian Pharmacopoeia. Vol. 2463. Indian Pharmacopoeia Commission, Govt. of India, Ghaziabad; 2010. p. 2550. 21. Anonymous. The Ayurvedic Pharmacopoeia of India. Appendix. Vol. V. Delhi: Department of AYUSH, Ministry of Health and Family Welfare, Govt. of India; 2008. p. 213-4. 22. Singh S, Machwal I, Chauhan MG. Pharmacognostic study of male leaves of Trichosanthes dioica Roxb. With special emphasis on microscopic technique. J Pharmacogn Phytother 2010;2:71-5. 23. Kapoor M, Jasani N, Acharya N, Acharya S, Kumar V. Phytopharmacological evaluation and anti-asthmatic activity of Ficus religiosa leaves. Asian Pac J Trop Med 2011;4:642-4. 24. Rajeswari J, Kesavan K, Jayakar B. Phytochemical and pharmacological evaluation of prop roots of Pandanus fascicularis Lam. Asian Pac J Trop Med 2011;4:649-53. 25. Lachumy SJ, Sasidharan S, Sumathy V, Zuraini Z. Pharmacological activity, phytochemical analysis and toxicity of methanol extract of Etlingera elatior (torch ginger) flowers. Asian Pac J Trop Med 2010;3:769-74. 26. Subramanian B, Sangappellai T, Rajak RC, Diraviam B. Pharmacological and biomedical properties of sea anemones Paracondactylis indicus, Paracondactylis sinensis, Heteractis magnifica and Stichodactyla haddoni from East coast of India. Asian Pac J Trop Med 2011;4:722-6. 27. Nayak BS, Patel KN. Pharmacognostic study of Jatropha curcas leaves. Int J Pharm Tech Res 2010;2:140-3. 28. Thomas S, Patil DA, Patil AG, Chandra N. Pharmacognostic evaluation and physicochemical analysis of Averrhoa carambola L fruit. J Herb Toxicol 2008;2:51-4. 29. Kumar S, Kumar V, Prakash O. Pharmacognostic study and anti-inflammatory activity of Callistemon lanceolatus leaf. Asian Pac J Trop Biomed 2011;1:177-81.